“A rich winter warmer with a kick,” says the excellent West Country FoodLover magazine, which has this variation on a classic recipe. 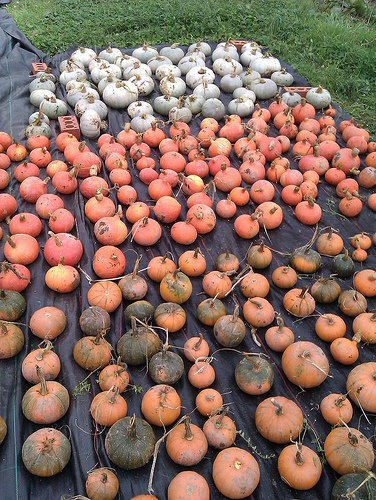 Use the Crown Prince or Uchiki Kuri squash in Camel CSA’s boxes. Heat the oil or butter in a large heavy-based pan over a medium heat. Add the onion and cook for 3–4 minutes. Season with salt and pepper and add the garlic, ginger, chilli flakes and cinnamon stick and cook for a few seconds before adding the squash. Add a little more oil/butter if needed. Add the honey (optional). Put the seeds and peel in a thin muslin cloth and securely tie at the top. Pour in a little of the stock, increase the heat and scrape up the bits from the bottom of the pan. Add the remaining stock, and the muslin bag, and boil for about a minute. Reduce the heat to a simmer; cover with the lid and cook for about 45 minutes until the squash is soft and the flavours have developed. Remove the cinnamon stick, and whiz with a stick blender until smooth. Add hot water if the soup is too thick. Transfer to a clean pan to heat through, and season if required. Serve with wholemeal or rye bread.